On a blue-skied, crisp, autumn morning, there are few places more beautiful than the seaside suburb of Monkstown. Moving away from scenic, peaceful seafront, I find myself wandering along Monkstown’s main promenade, the Cresent. Even on a Wednesday morning the charming strip is bustling with activity, and tables anywhere that offers breakfast, like Cinnamon, Avoca’s Salt Café, and Café du Journal, are in demand. The footfall, and well-heeled clientele, that keeps the row of diverse eateries busy has earned it a reputation as a ‘Golden Mile’ of restaurants, and hoping to capture a slice of the action is the Cresent’s latest offering, Le Plancha. Though new to Monkstown, opening just eight weeks ago, this is not owners Andrew Lawlor and Eimear Brannelly’s first time feeling like the new kids on the block; having already captured the hearts of the people of Blackrock, where they first opened five years ago. Chef Andrew, and his wife Eimear, who runs everything but the kitchen, “I would burn water,” she laughs, found a winning formula by bringing the best of flavours from France, Spain and Portugal to South County Dublin, and an eclectic selection of wines that reflects their Mediterranean inspired menu. It was far from Paella that Andrew was raised eating, though he grew up in a family that loved cooking the Irish classics. “My grandad was a great cook, a great baker. We grew up with his baking, and there would always be something on the go in the house. There would always be roast dinner, or real old school Irish food like bacon and cabbage, coddle, and his own brown bread with dripping sandwiches, people wouldn’t know what that is nowadays!” he says laughing. With a love for food ingrained in him, Andrew started working in kitchens at the age of 16. “It’s really funny actually because I started just down the road from here, in a place called Wright’s Brasserie, it was really popular back in the day.” He’s now back where he started, but in the intervening 25 years has seen Andrew do “a lot of cooking, eating and travelling” all over Dublin, Australia and Europe. It was before they had kids Alex and Robbie, that they embarked the trip of the lifetime that was to inspire their restaurant. “We travelled from Lisbon and all the way through Madrid, the North West of Spain, and into San Sebastian,” explains Andrew, positively beaming just looking back on the journey. “Over there with just three ingredients they create an amazing meal with amazing flavours, by just cooking it simply. We felt it was a such a casual way of doing things, and said let’s explore this when we get home,” says Eimear. In 2011, armed with advice, a business plan, and their hopes and dreams, the couple approached several banks, but were at first met with the sobering reality of peak recession Ireland. “If ever there was a challenging time to set up a business it was then,” admits Andrew. Thankfully Bank of Ireland took the leap of faith with them, and they found a place in Blackrock, which Eimear admits “wasn’t in great shape” having been left idle for a while. “We were doing it on such a shoestring. All our family and friends were there helping us. We did as much of it as we could ourselves, it was very hands on. I remember spending a week sanding the walls, but it was part of the excitement,” Andrew recalls. 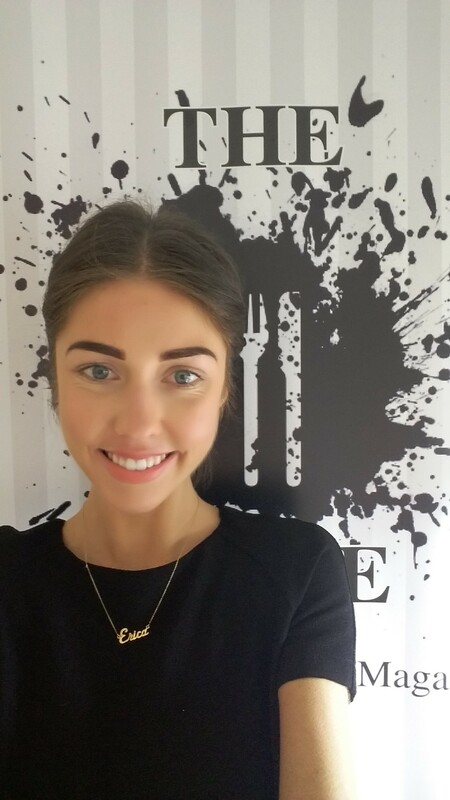 Using her creativity, and skills from her previous career as a designer in an advertising, Eimear crafted their logo, menus, posters, and business cards; cutting out the need to outsource, and, vitally, another expense. 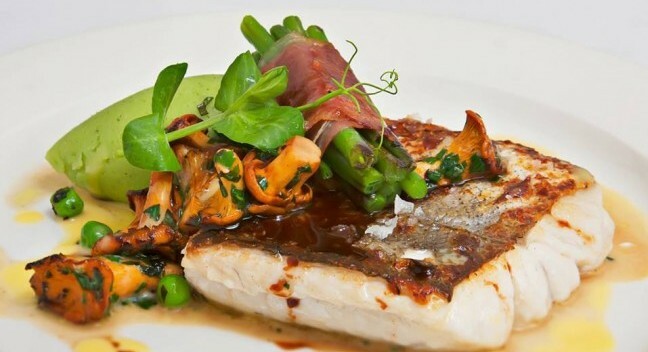 In Blackrock, they carved their own niche as a “quintessential neighbourhood bistro” in Blackrock, says Andrew, and mostly through word of mouth within a few months they were busy every night. “It took us a few months to get into our stride, but once we got going we just took off,” he says, proudly. “We were so lucky with the area we opened up in, because it was a real community, such lovely people,” says Eimear. “It was like a symbiotic relationship, we were providing a service to them and they were supporting us,” Andrew adds. Always “keeping their options open”, the couple kept an eye on the market, and when an opening came about along this golden mile they snapped it up, and now with the same delicious food, and a new stylish and spacious dining room, they hope to woo the people of Monkstown too. The menu has evolved somewhat to suit their new surroundings with steaks and grilled seafood joining customer favourites like Roast Thornhill Duck Breast, Chicken and Chorizo Paella, and their signature Goats Cheese and Beetroot Salad. To the Crescent they have also brought a new cocktail menu, and a Sunday brunch that brings a little bit of Mediterranean flair to the weekend ritual. Along with the challenges that come with opening a new restaurant, they continue to do their best to keep a balance between business and family time. Eimear spends the day with the boys, and when she goes to work in the evenings they have complete trust in their childminders, one of whom is godmother to their three and a half year old, Alex. 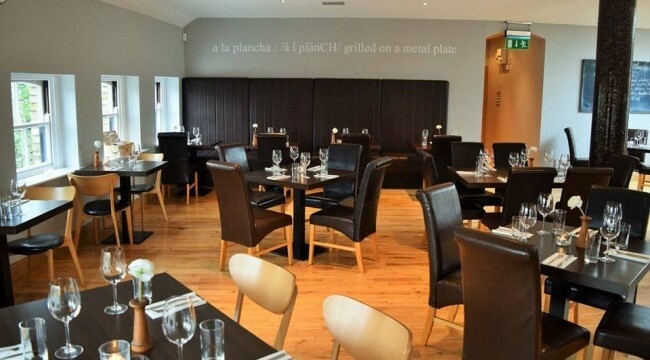 Alex, elder brother to Robbie, is starting to really relish his visits to Le Plancha, and Eimear says the lure of a chocolate brownie with ice cream might have something to do with that. “It changes every day, whether it is mommy’s or daddy’s restaurant, so he has to learn yet that it’s mommy’s,” she jokes. Eimear has just as much trust in Andrew’s skills in the kitchen, but she does sometimes suspect his taste buds. “When we travelled there were some questions marks over some of the dishes.” “She’s not into tentacles,” Andrew laughs. “There were some crazy soups he was trying, cow’s head soup, he’d try anything like that – eyeballs and all.” Customers can be glad that this is not one of the Mediterranean imports on the menu at La Plancha, and that Eimear is there to police some of Andrew’s more exotic inclinations.